Costco LEGOs Q & A: The Best Deal In Town or Not Worth the Trip? Costco can be so beneficial for families. You can often find quality products at a great price. Their various organic food selection is an example. But, what about something like toys? More specifically, what about Costco LEGOs? Worth the trip to find a deal or keep on looking? LEGOs have been one of the most popular toys for boys and girls since their start in 1932. The colorful, interlocking bricks give kids a chance to put down their screens, engage their minds, and unleash their imaginations. The problem is, buying new LEGOs can get expensive quickly. Sets that follow a certain theme, like Star Wars or Harry Potter, charge more than normal for the affiliation. If Costco is known for its competitive prices, then are Costco LEGOs the best deal? Costco LEGOs Q & A: Best Deal In Town or Not Worth the Trip? Q: Does Costco sell LEGOs? A. Yes. There is often an assortment of LEGO products available at Costco, although it does vary. You can also shop online at Costco.com. Overall, you will see considerably less variety than a place like Walmart, Target or Amazon. Q: Why does Costco have less selection than other stores? Costco operates membership warehouses based on the concept that offering members very low prices on a limited selection of products will produce high sales volumes and rapid inventory turnover. This rapid inventory turnover, when combined with the operating efficiencies achieved by volume purchasing and reduced handling of merchandise enables Costco to operate profitably at significantly lower gross margins than traditional wholesalers. Translation: Costco sells hand-picked, quality brands faster and with fewer employees than supermarkets. After speaking with an administrative representative at my local Costco who declined being named for this interview, he explained that Costco doesn’t carry any particular product year-round. Their mission is to find the trend, buy it early, mark down the price considerably, and sell it at the peak season. Q: How can I save the most money on LEGOs at Costco? A: Knowledge is key. Costco’s LEGO selection is very limited during the first two-thirds of the year. Your best bet during those months is to glance at the selection online and keep in mind other options like Amazon or Walmart. Sign up for an Executive membership. By doing so, you’ll receive 2% cash back on every qualified purchase. At the end of year, you receive a check in the mail – redeemable only at Costco – for all the money you earned back. Browse your monthly Costco flier. It’ll come to you in the mail right before the beginning of a new month and includes every sale, including toys. Sign up for email offers. You’ll receive exclusive coupons and deal alerts from Costco via email. Follow deal hunting blogs like Krazy Coupon Lady to receive the most up-to-date information about Costco products. 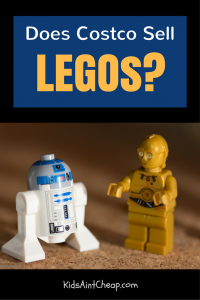 For example, KCL created this detailed post on every LEGO toy available during the Christmas shopping season of 2016. Many of the LEGO products were discounted significantly! Is Costco the best place to buy LEGOs? Not until the holidays, and not if you’re looking for a wide variety. If you just want to buy some new LEGOs within your price range, then I suggest using some of the money-saving techniques mentioned above. The great thing about Costco is that you can’t loose, their return policy is outstanding. If you find a better price on LEGOs, and want to return them at Costco, they’ll probably take them. So, keep your eyes open for a deal, follow a blogger who’s going to do the leg work to keep you informed during the holidays, and go find yourself a great deal. What’s your favorite thing to shop for at Costco?